Cash In on the Best Online Sportsbook Offers Now at TopBet! After three-straight wins against lightweights, the Gators were shot down last Saturday, losing to Tennessee, 38-28. 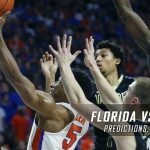 The loss was a bitter pill to swallow for Florida, considering that it had a 21-point lead at one point in the first half and that it was the Gators’ first setback at the hands of the Vols since 2004. 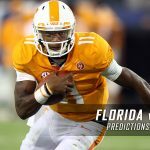 The Gators’ defense was exposed by Tennessee. Florida entered the game having allowed just 14 total points in the previous three games, so any arguments about the Gators owning the best stop unit in the nation can be put to rest—at least for the meantime. Their defense can get its mojo back this coming Saturday against the Commodores, who are hardly the most spectacular offense in the country. 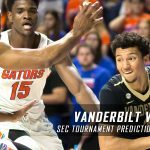 Vanderbilt has the third lowest scoring average in the SEC with 23.8 points per game. Austin Appleby appeared to have created a quarterback quandary, when he threw two touchdown passes in the first half Saturday, but a poor second half from the backup QB suggests that Luke Del Rio (injured) will be back under center as soon as he’s ready. The Gators defeated Vanderbilt in a mud crawl, 9-7, last year. They are 9-1 SU and 5-5 ATS in their last 10 games against the Commodores dating back to 2006. 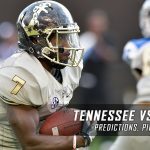 Vandy will take a win any way they can, including ones in which they were just plain lucky. Take for example their 31-30 overtime victory over Western Kentucky last Saturday. The Commodores were well on their way to losing until WKU missed on a two-point conversion attempt as time expired in the first overtime. The Commodores, however, don’t want to be in that position again. They want to establish dominance early, something that’ll be hard to do against the still stout defense of Florida. Having said that, the Gators’ defense showed it wasn’t what most people thought it was prior to the Tennessee match with the Vols picking it apart in one half. Vanderbilt has some decent offensive weapons to bend and crack Florida’s stop unit with the likes of Kyle Shurmur and Ralph Webb. Shurmur has a touchdown pass in each of the last three Vandy games, while Webb is second in the SEC with 118.0 rushing yards per game. Webb’s five rushing TDs is tied for most also in the conference. Vanderbilt is 4-2 ATS in its last six games as an underdog by at least eight points. 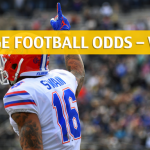 Create a betting account now and create a winning NCAAF parlay.